Congratulations—you made it through the madness of the first month back! 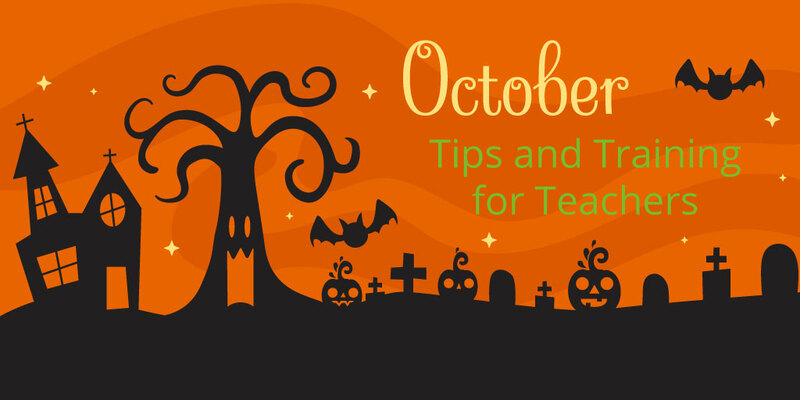 Now that you and your students are settled, why not work a little fall and Halloween fun into your lessons? Halloween Gallery Pack: Boo! Halloween is an incredibly fun time of year, and this spooky gallery pack gives you plenty of opportunities to incorporate the holiday into your lessons. "Get More" With Homophones: We have gathered all of our homophone lessons together to build this collection so you can give your students a chance to practice using the correct homophone! Lesson Renovation | Pocket Charts Galore: This lesson should excite many younger grade ELA teachers! The activity is a simple, interactive pocket chart where students move letter cards to create CVC (consonant-vowel-consonant) or CCVC and CVCC words. It also includes sound recordings for each word so that students and teachers can hear the word before creating it. "Get More" With Liquids and Solids: The latest lesson in the "Get More" series introduces the concept of matter, defining liquids and solids in an interactive format. MimioStudio™ classroom software offers a variety of ways to quickly and easily add interest and engagement to your lessons. Many great tools are built right into the MimioStudio toolbar, making it easy to access anytime. One cool tool is the Reveal function, which takes the place of the old-school method of putting a piece of paper on top of something you may have presented on an overhead projector. When the Reveal tool has been activated, you’ll see a grey screen with directional arrows take over your entire screen. Depending on which arrow you click and slide, you’ll be able to uncover lesson material from either top to bottom, bottom to top, left to right, or right to left. Another option is the Spotlight tool, which creates a spotlight that can be moved around to focus on any area of your screen. By clicking outside the spotlight area and dragging with your stylus, you are able to move the spotlight to focus on any other area. By clicking and dragging on the spotlight border, you can change the size of the shape. Integrating mobile devices into your curriculum can prove to be a powerful tool if done correctly. The power of the mobile device isn’t necessarily the device itself, but how it is used in the educational space. With the MimioMobile™ collaboration app, you can integrate virtually any device you have in a classroom and bring out the true learning potential of the device. Student devices are also able to be given one-to-one control by the teacher and have full control of the teacher computer in order to present a lesson or accomplish a task. One powerful feature comes in the form of assessment. MimioMobile leverages your devices to include built-in assessment capabilities, including multiple choice, true-false, as well as short answer and essay answer options. Bring out the real power and easily integrate your devices through simple assessments, giving you real-time feedback from your students. As an added bonus this month, we have scheduled some of our most popular Quick Learn sessions to take place at 12:00pm ET. Register now to join us for a midday treat!